Play has come to an end on Day 1 of the World Poker Finals Main Event. There look to be around 140 players remaining. Play will resume at noon and play will continue for another five levels. The end of Day 1 chip counts and Day 2 seat assignments will be posted here on FoxwoodsPoker.com as soon as they are available. The clock has been stopped and it has been randomly selected that there will be four more hands of play tonight. At the end of four hands at each table, players will bag their chips and play will conclude for the night. Jon Aguiar has been knocked out of the World Poker Finals Main Event late on Day 1 when his A-K ran into the pocket aces of Grant Lang. Justin Schwartz, who at around 4am this morning won the $2,500 No-Limit Hold 'em event for over $68,000, has just been eliminated late on Day 1 of the World Poker Finals Main Event. Tony Dunst, host of the Raw Deal on the World Poker Tour, talks with Jay Newnum during a break on Day 1 of the World Poker Finals Main Event. The players have returned from break and the blinds have been increased to 150-300 with a 25 ante. There are approximately 153 players remaining and this will be the final level of the night. 2010 World Poker Finals Champion Jeff Forrest is seated next to Jonathan Little and the Godfather of Online Poker, Cliff "JohnnyBax" Josephy. Tony @Bond_18 Dunst Now at the Live Stream Table! The man behind the World Poker Tour's Raw Deal, Tony Dunst, has been moved to the live stream feature table. 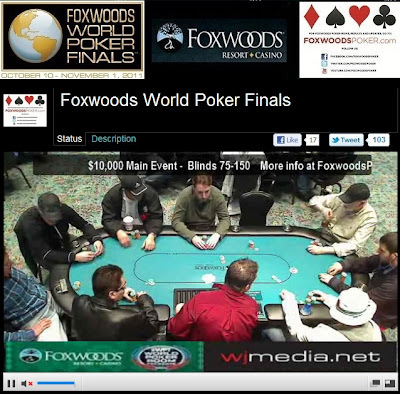 Just click "Watch LIVE Feature Table" at the top of the page to view the feed. The players have returned from break and the blinds have been increased to 100-200. The board reads 180 players currently registered with registration remaining open until the beginning of play tomorrow. Late in Level 2 of the World Poker Finals Main Event, Jason Mercier has taken his seat. Another interesting table match-up finds former WPT Champion Dwyte Pilgrim seated next to Justin Schwartz and David Inselberg. Schwartz won the $2,500 No-Limit Hold 'em event here at the World Poker Finals that did not end until around 4am this morning. He took home over $68,000 for his win. Inselberg is not stranger to the World Poker Finals Main Event, finishing second last year for over $300,000. Rob Brown and Andy Frankenberger find themselves seated next to each other on Day 1 of the $10,000 World Poker Finals Main Event. Brown won the $500 Bounty Deep Stack event here at the 2011 World Poker Finals and Frankenberger is the reigning World Poker Tour Player of the Year. World Poker Finals Main Event Streaming Live! You can now watch the feature table on Day 1 of the World Poker Finals Main Event. Just click "Watch LIVE Feature Table" at the top of the page to view the live feed. Erik Seidel has just doubled up through Will Failla early in Level 2 when Failla flopped two pair with A-K on an A-K-Q board. However, Seidel held pocket queens to win the pot and double his chip stack. The players in the $10,000 World Poker Finals Main Event are now on their first break of the day. There are currently 175 players registered. Steve Brecher, Ryan Welch, Dwyte Pilgrim, David Inselberg, Mike Sica, David Tuthill, Lee Markholt, Matt Glantz, Matt Matros, Matt Brady, Kyle Loman, James Campbell, James Carroll, Jon Aguiar, Spiro Mitrokostas, Darren Elias, Todd Terry, Jonathan Little, Cliff Josephy, Hoyt Corkins, Andy Frankenberger, Rob Brown, Mike Dentale, Cornel Cimpan, Allen Kessler, Kathy Liebert, Christian Harder, David Sands, Chris Klodnicki, Brian Lemke, Steve Ryan, Erik Seidel, Dan Shak, Jeff Forrest, John Cernuto, Matt Stout and David Williams. Michael Forca has the unfortunate honor of being the first player knocked out of the World Poker Finals Main Event. Forca got all-in before the flop with [Ac][Kc] but ran into the pocket kings of James Frangoulidis. The kings of Frangoulidis held up and sent Forca to the rail just a half hour into the tournament. We have just been told that registration will remain open until the cards are in the air on Day 2. There are a number of players who are going to be arriving late and this will allow players to register after play tonight or up until noon tomorrow. Cards Are in the Air at the Main Event! Mike Sexton just gave the "Shuffle Up and Deal" and cards are in the air on Day 1 of the $10,000 World Poker Finals Main Event! World Poker Finals Main Event About to Kick Off!!! The World Poker Tour $10,000 World Poker Finals Main Event is about to get underway. 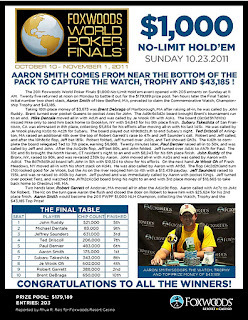 Stay tuned to www.FoxwoodsPoker.com for all the updates, photos and videos from the event! Justin @stealthmunk Schwartz Wins the $2,500 Event! Justin Schwartz is the champion of the $2,500 No-Limit Hold 'em event. He takes home $68,131, the World Poker Finals Trophy and the watch! 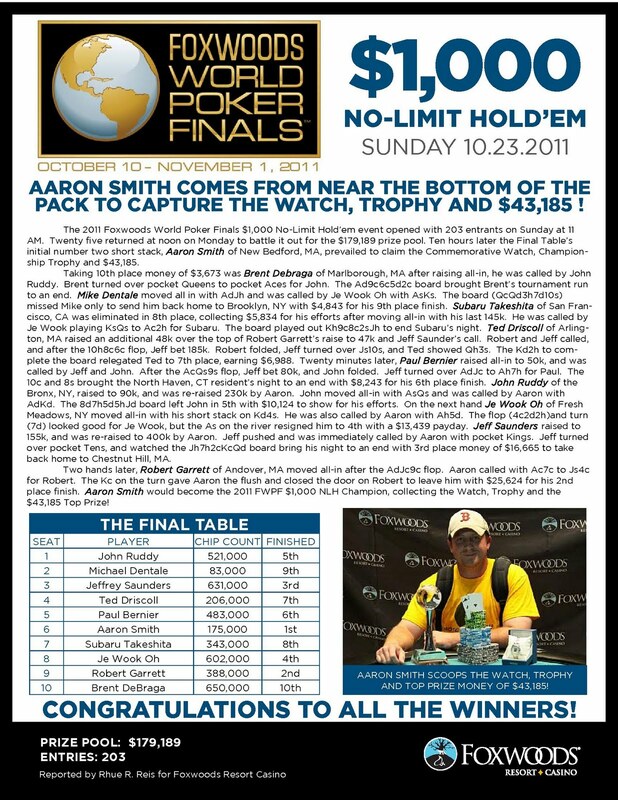 Congrats Justin and be sure to join us at noon tomorrow for the kick-off of the $10,000 World Poker Tour Main Event! Raskin's eights are in the lead until Schwartz spikes an ace on the flop of [Ac][Kc][7s]. The turn is the [Tc] and the river comes the [Jh]. Micah Raskin is eliminated in 2nd place for $38,249. The board comes [Kd][Kh][Td][5s][4c] and Schwartz wins the pot to eliminate Petranglo in 3rd place for $24,145. The board runs out [Ac][4d][4s][Ah][5d] and Schwartz wins the hand to eliminate Lee in 4th place for $19,364. The board comes [Qs][Th][5s][4c][8s] and Petranglo's jacks hold up to win the pot and eliminate McNeil in 5th place for $15,538.